It's here! Transparent PROFIBUS PA link for 12 Mbps with COMbricks! PROCENTEC’s transparent PROFIBUS PA link/coupler enables seamless high speed integration to PROFIBUS PA. It powers the attached devices and fully emulates all PA devices as DP devices on the PROFIBUS DP side. It does not require adjusted busparameters and is therefore suitable for all DCS and PLC systems, even ones running on 12 Mbps. The combined internal ProfiTrace and oscilloscope make this product extremely useful for remote maintenance over Ethernet. Jitter, noise, DC current, DC voltage, bar graph and oscilloscope, it is all there and easy to access. The free CommDTM allows access for asset management tools over Ethernet. The PA link is a module that fits in the COMbricks system able to carry 9 PA links and a RS 485 or Fiber Optic module. It can also be a customized mix of PA modules with other communication modules. 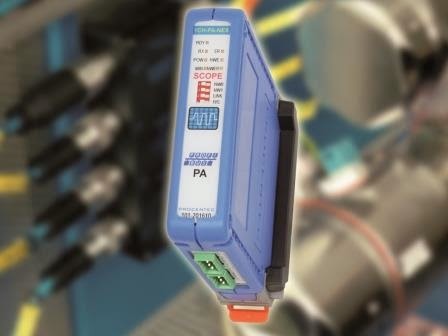 The PA link can provide 500 mA segment current on a customizable bus voltage.